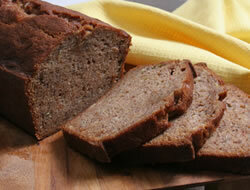 This banana bread has less butter in it and yogurt instead so its a little bit healthier. Its moist from the yogurt and you'll never miss the butter. Preheat over to 350°. Spray a 9x5 inch loaf pan with cooking spray. In a separate bowl beat together sugar and butter until well blended. 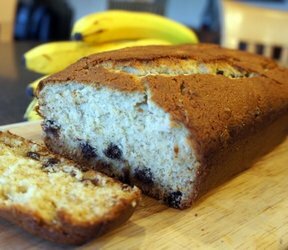 Add banana, yogurt and vanilla. Beat until blended. Add flour mixture. Beat on low until just moist. Spoon batter into prepared pan. Bake at least 50-60 minutes, until a toothpick come out clean. Cool 10 minutes before removing from pan. 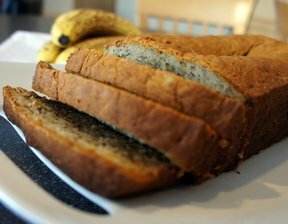 "I love banana bread and couldn't tell the difference between this one and one with more butter. 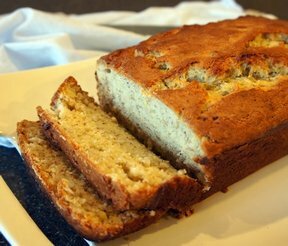 Very good banana bread recipe."